During the late 1950s a new name unexpectedly appeared on the British popular music scene. It was Manuel and the Music of the Mountains and the group recorded about thirty LPs over the following years, including a surprising number of hits. It was an original concept, contrasting the clunky sounds of folk-like South-American instruments with lush orchestral strings. Many people must have imagined Manuel as a mustachioed Peruvian in a poncho, thoughtfully strumming a charango in his mountain village. But sadly, Manuel didn’t exist. Neither did the mountains. Manuel was the pseudonym of the British band-leader Geoff Love who recorded the titles in London with a studio orchestra. He was an exceptional band arranger, jazz player and composer of easy-listening music. Under the name Manuel, he popularized the slow movement of Rodrigo’s guitar concerto, which he served up in a Hollywood-style arrangement of saccharine sweetness with soaring strings and obligatory rhythm section. In 1975, the recording was released as a single and by the following year it had reached the top of the charts. Mountains have often stirred the imagination of artists and composers especially since the dawn of the Romantic era. The Czech composer Vítezslav Novák wrote a Symphonic poem entitled In the Tatra Mountains and the French composer Vincent d’Indy wrote the Symphony on a French Mountain Air as well as a vast symphonic poem entitled Jour d’été à la Montagne. Then there was the American composer Alan Hovhaness whose Second Symphony is called Mysterious Mountain. There are probably dozens of other examples but mention “mountains” to classical music followers and they’ll probably remember a work by a Russian composer who wanted to create a musical picture of a witches’ Sabbath on St. John’s Eve. The setting was a stormy night on a bleak mountain and the composer was twenty-eight at the time. The original Russian title translates literally as Saint John’s Eve on Bald Mountain, but it’s known by a number of alternative titles in English. For some years, Mussorgsky had been toying with the idea of composing something on the subject of Gogol’s short story, St. John’s Eve. 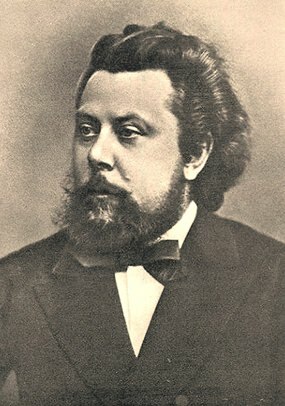 Mussorgsky (whose name has alternative spellings) began writing this orchestral piece at the beginning of June 1867 and strangely enough, completed it on the eve of St. John’s Day, 23rd June. Even more strangely, his original score was not published until a hundred years later in 1968. There was of course, a reason. Shortly after Mussorgsky’s premature death (caused largely by excessive booze) his friends prepared some of his manuscripts for publication in an attempt to preserve them for posterity. Most of the editing work was done Rimsky-Korsakov, who in 1886 produced his edition of the work to which he had characteristically made improvements to the original. This version has been used for most concert performances ever since. Only in recent years has there been interest in Mussorgsky’s original score. Millions of people heard this work through yet another version in the Walt Disney 1940 animated movie, Fantasia. It was arranged by the conductor Leopold Stokowski and this is the version played by the National Youth Orchestra of Spain directed by the Uruguayan conductor and composer, José Serebrier. And here’s an interesting connection: Serebrier was once Stokowski’s associate conductor. This powerful work dates from 1915 and was the last symphonic poem that Strauss composed. By this time, Strauss was at the height of his fame, especially as an opera composer and although he called the work a “symphony” it doesn’t follow the conventional symphonic structure. Instead, it consists of twenty-two short continuous sections depicting the experiences of eleven hours spent climbing an Alpine mountain. It was inspired by the composer’s participation in a real mountaineering expedition in his youth, during which his luckless party managed to lose its way on the way up the mountain and met with a terrifying thunderstorm on the way down. The work requires an enormous orchestra which includes an organ, two sets of timpani, extensive percussion and a wind machine. An in case you’re wondering, the wind machine doesn’t actually produce wind, merely the sound of it. Incidentally, Richard Strauss (who was German) was no relation of the Strauss family of waltz fame (who were Austrian). The premiere was given in Berlin with Strauss himself conducting and although he was evidently pleased with the performance, some critics were not impressed. Nevertheless, the work has stood the test of time and it shows Richard Strauss as a superb orchestrator. It’s one of the finest examples of brilliantly coloured, almost cinematic musical tone-painting and includes one of the most thrilling storm sequences ever written.